I love when I can be the chill mom who doesn't care about another snow day. But the reality is that that is not where I'm at right this second; my work load is very heavy and Violet hasn't been sleeping well (cue zombie mom music). 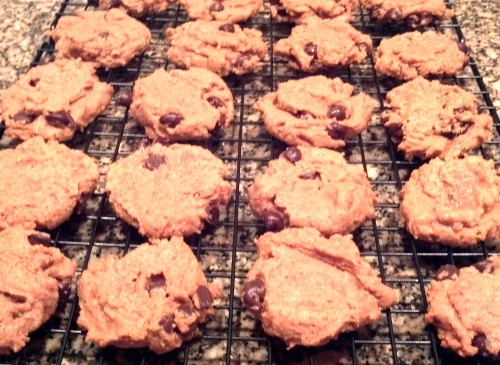 Given that everything in Massachusetts seems turned upside down today, I'm skipping the Weekly Blueprint and instead present you with what offered a wonderful source of cabin fever relief this weekend: a recipe for ridiculously easy and yummy gluten-free peanut butter chocolate chip cookies. Seriously, 5 ingredients, 10 minutes of prep time, and 10 minutes of baking time is all that stands between you and a dose of happy. I clipped this recipe from the December 9, 2012 issue of the Globe's Parade section because: a) it won a cookie contest (I love a good community vetting); b) the ingredient list is short (5 items); and c) the recipe is naturally gluten-free (i.e., no need for xantham gum and other flour substitutes...I'm now constantly on the lookout for gluten-free items for the whole family, to accommodate Violet's allergies). 1. Preheat oven to 325 degrees. In a large mixing bowl, mix sugar, peanut butter, egg, and vanilla until well blended. Stir in chocolate chips. 2. 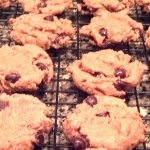 Form cookie rounds using a small spoon; place on parchment or a Silpat mat. Press each cookie with the back of a spoon to flatten a bit. Bake 10-12 minutes; the cookie will puff slightly and no longer look raw. Cool for 2 minutes on baking sheet then transfer to wire rack. And that's it -- these cookies are so easy to make! Violet helped with the mixing and Laurel loaded the dough onto the baking sheets. 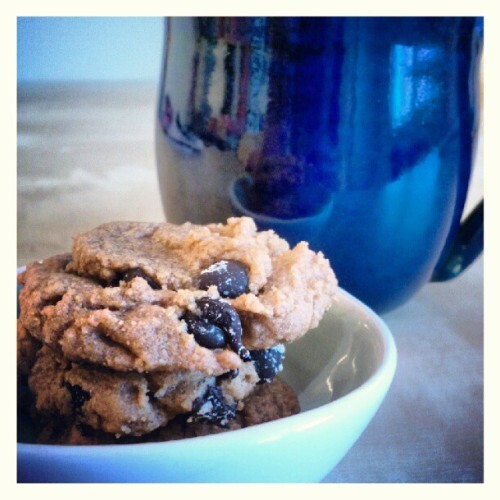 The cookies are wonderful on their own, but especially delicious with coffee. Enjoy!